Officials from Chinese embassies in Europe have reportedly attempted to prevent a 100ft high Tibet-flag balloon to fly over a festival in Bristol, in the United Kingdom, under the pretence that it would put pressure on Sino-British relations. Organizers have refused to submit to such pressures, choosing to let it fly as a symbol of peace and compassion. At nearly 100ft high the Tibet balloon is arguably the largest Tibetan flag in the world. But as the unique hot air balloon prepares to soar over Bristol this week, Chinese consternation over its controversial, eye-catching design appears to be also rising. Mysterious individuals purporting to be Chinese embassy officials have made three attempts to ground the balloon across Europe – in Spain, France and the UK – since it was first launched four weeks ago. Organisers of the Bristol International Balloon Fiesta, beginning on Thursday, have refused to ban the balloon, which is flying as a symbol of peace and compassion, despite pressure to cancel its participation in the name of Sino-British relations. An email, purporting to be from the third secretary in the political section of the Chinese embassy in the UK, urged the fiesta’s organising committee to give serious consideration to the issue, and stressed China did not want the event to be used as a platform for Tibet separatist activities. The Chinese embassy did not respond to requests from the Guardian for comment. The approach follows a similar one to organisers of a balloon festival in France last week, and another in Spain four weeks ago. Funded by private sponsors, the Tibet balloon – named Tashi, meaning good fortune in Tibetan – was designed in close cooperation with UK Tibetan community representatives and launched in Spain on 11 July after a blessing at the Sakya Tashi Ling Buddhist monastery near Barcelona. The balloon depicts the Tibetan flag but displays no political text. Co-pilots Paul Dopson, 45, and his wife, Heaven Crawley, 44, from Stroud in Gloucestershire, hope it will draw attention to Tibetan issues and raise funds for charities working to support the cause of Tibet. Since its launch its movements have apparently been fastidiously tracked, with intense behind-the-scenes lobbying for it to be grounded. The couple were informed by organisers of the European Balloon Festival in Igualada in Catalonia, Spain, that officials, claiming to be from the Chinese consular offices in Barcelona, had contacted organisers to communicate their concern “initially by email, then phone, and then they visited the launch site on the mornings of the flights”, said Dopson. Though the balloon was in Spain at the time, it had not registered to fly in that event, and did not take part, he said. However, one of the other pilots had a similar name to his, which may have led to the erroneous belief it was due for lift-off. He explained he did not have the power to stop the balloon flying as “it is not a political demonstration”. Ian Martin, of Flying Enterprises, the hot air balloon operator which is supporting the Tibet balloon, and who is a member of the organising committee of the Bristol fiesta, said he received an email from someone claiming to be the third secretary in the political section of the Chinese embassy in London, who gave the name Xinkai Dang, but not an official Chinese embassy email address. The flag is banned in Tibet but is flown by Tibetan people and their supporters around the world. Dopson said of the lobbying: “It certainly is very intimidating. When you hear of the Chinese actually arriving at the launch field, when we were in Spain, to see if the balloon is there, you think, ‘well, what can happen next?’ It’s a strange situation. We just didn’t foresee it at all. Martin passed details to the fiesta’s organising committee. “The organising committee, which I am part of, has taken an attitude that we are not going to ban the balloon from coming just because of this,” he said. 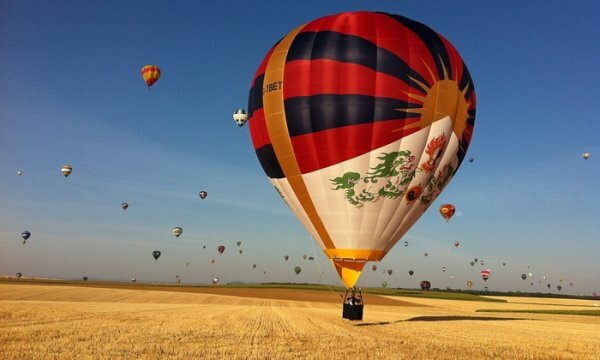 Jane Oakland, chair of the Bristol International Balloon Fiesta, said: “We understand that a hot air balloon decorated with the Tibetan flag has registered to fly at the fiesta this weekend. A spokesman for Bristol city council, on whose land the balloon festival will be staged, said it had “no authority or sight of decisions taken” regarding the event, which is run and managed by Bristol International Balloon Fiesta. “The council has been told by the company that the Chinese embassy has contacted them regarding the flight of the balloon,” he said.